Conjunctivitis (also called pink eye) is a condition where the white part of your eye (sclera) becomes red. It can really only be accurately diagnosed by an eye doctor. It is not sight-threatening, but there are conditions that mimic its appearance that can cause permanent loss of vision. So it is important that if you are having any of the symptoms below, do not self-diagnose. Call our office for an appointment. We set aside times for emergency visits for this. 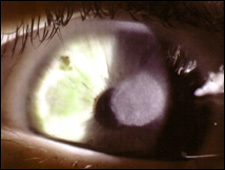 Photo of a patient who thought they had pink Eye but really had a Herpes Simplex Infection of the Eye, (the same virus that causes cold sores) which needed to be treated with anti-viral drugs. Notice the green and yellow spots. 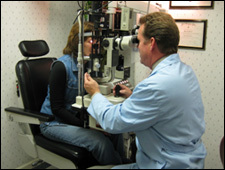 Dr. Skowron diagnosing a corneal ulcer through a slit lamp exam. If you have pain or light sensitivity alone or with other symptoms, stop all contact lens wear, and call the office immediately. You may have a CORNEAL ULCER, which can cause permanent scarring and vision loss. Photo above: Patient who kept using Visine, thinking their eye was red from lack of sleep. But actually had a Corneal Ulcer cause by wearing dirty contact lenses. 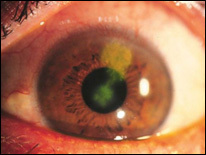 The green spot in the middle is the site of the infection. 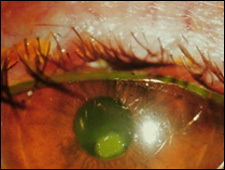 Photo above, right is the end result of a severe corneal ulcer. Notice the large, white scar in the middle of the cornea. Ulcers can be sight-threatening and need to be treated immediately and aggressively. This patient was actually hospitalized for 4 days in order to save the eye.